By now (or so I believed) the well documented rise and fall and than revival of one of pop music’s titans and true geniuses, shouldn’t come as any shock. Perhaps the nuanced details remain a mystery to most, but the crippling mental fatigue and illnesses that conspired to overwhelm Brian Wilson now go hand-in-hand with and are synonymous with The Beach Boys legacy. Plagued since childhood by the overbearing bullying of others, Brian was made nearly deaf by the clouting punishment of his patriarch Murry Wilson (a failed composer with little talent, forever enviously cruel towards his eldest son), worn down by his cousin and bandmate Mike Love – a year older than Brian but may as well been twenty, the omnipresent ‘straight’ put off by anything less than sweet and commercial, constantly grappling in a power game to control the band -, and emasculated, cut off from the world by the dubious therapist Dr. Eugene Landy. Arguably this triumvirate of manipulative, all damaged in their own way, individuals reflected their own insecurities, envy and even misunderstandings – Love just not getting it and stoic in not wishing to rock the proverbial boat of success – onto Brian; and perhaps due to a lack of ego himself, was unable to believe in his own self worth allowing others to both take advantage and question his musical aspirations. Unnerved, strung out and growing isolated from both his childhood sweetheart and first wife Marilyn, and his siblings, Brian went into a slow and long drawn out decline. Rare touches of genius would still sparkle occasionally, but after the less than rapturous reception at the release of Pet Sounds, and the aborted (though saved from the ashes and finally recorded and played live forty years later) American peregrination behemoth SMiLE, it was more or less, downhill all the way. Adrift now of The Beach Boys, wheeled out sporadically but later sacked, Brian had already undergone numerous treatments during the late 60s, and in 1975 at her wits end, Marilyn called in the services of the quack to the stars, Landy. Though as the movie depicts, his motives and less than orthodox style of treatment appeared quite sinister, he did manage to reduce a bloated lethargic Brian into a slimmer, healthier individual, ready to return back to the Beach Boys fold. However as it would transpire, Landy took rather too much of an interest, going as far as to attend band meetings and make decisions on Brian’s creative dealings. He was ceremoniously sacked and cast out, losing not only his golden egg, but also losing his professional licence for his methods and liberal pill dispensing (the press would christian him Dr. Feelgood). Yet ironically he was recalled back during the 80s after Brian, at his lowest ebb, took an overdose of alcohol, cocaine and psychoactive drugs. This time Landy gave no quarter and micromanaged every single aspect of his patients life. Brian would be completely cut off from everyone, and handled like a simpering child by his new legal guardian (who merely replaced Brian’s monstrous real father Murry), with a team on standby to make sure he never wandered from the good doctor’s path of recovery: a recovery that led to Brian’s eponymous solo album of 1988 (Landy brazenly got credits as executive producer and co-writer), of which the opening track Love & Mercy is used for the film’s title. In fearing of being institutionalised, Brain would meekly allow this infringement of his privacy and daily life. Over stepping his remit, and coming up against Brian’s, depending on who’s account you believe, saviour Melinda Ledbetter (a model turn Cadillac sales women), Landy was eventually forced out when his name mysteriously appeared as the main benefactor on Brian’s will. Already handing over a percentage and forced back into the studio to cover costs, Brian’s publishing rights would still not satisfy Landy’s mounting costs – charging an eye-watering $430,000 annually between 1983 to 1986 – and this along with Melinda’s timely intervention conspired to finally remove him. A complicated story then, the emphasis on redeeming a fragile genius from a reversion to a near childlike numb state, the film makers and script writers can’t possibly capture every nuance. Instead, Oren Moverman and Michael A. Lerner‘s touching story and unconventional story arc focuses on the perspectives of Brian and Melinda, and hones in on two specific timelines: the mid 60s and 80s. Whilst the story begins with the muddled mind of a younger Brian (an uncannily fragile and compassionate performance from Paul Dano) fading out to darkness, followed by a background montage of the Beach Boys more naive, carefree days (though even these moments show an already uneasy Brian plucking away on his bass guitar, wishing to be anywhere but on stage or in the limelight), we’re speedily propelled forward to John Casuck‘s placid later day Brian’s first meeting with Melinda. Virtuously played throughout by a thoroughly convincing, purposeful Elizabeth Banks, director Bill Pohlad uses her face as a gauge for reaction; whether it’s being played a whimsically beautiful piano motif or hearing the disturbing abuse meted out to Brian by his father. In her opening scene she attempts to sell him a car, before Landy and his posse arrive, but not before Brian slips her a note with ‘Lonely, scared, frightened’ scrawled on it. Not that the intention is to show any balance in Landy’s depiction, the wig adorned Paul Giamatti is a raging control freak; ready to suddenly blow in a torrid at any time, and constantly, even when smoothing things over, adding a creepy and threatening undertone to every word of advice and suggestion. Meeting one of the only real forms of opposition, Landy’ warnings towards Melinda eventually boil over into some hostile confrontations: an early scene in the dating storyline, with Giamatti’s Landy holding court whilst flipping burgers, grows steadily uneasy and finally ends with an explosive outburst, as a doped up Brian petulantly interrupts a boorish egotist regaling his own questionable writing virtues with calls to be fed. Faithfully recreated, Dano’s parts are sometimes tear-jerking. Though we’ve grown used to the back catalogue, hearing the building blocks and attentive beginnings of ‘You Still Believe In Me’, ‘Surf’s Up’ (this performance further convinces me of its eulogy quality and that it belongs on the 1971 titular LP rather than SMiLE), and ‘God Only Knows’ (stunning even its most fragile form, when the young Brian seeks his father’s approval but is despairingly put down by pater’s heartbreaking responses) send chills down your spine. Enthusiasts will be interested in seeing the mechanics of the Pet Sounds and SMiLE sessions; the fantasy of seeing the famed and near mythical Wrecking Crew at work. The crew’s revered and experienced drummer, possibly the best session drummer of the 60s, Hal Blaine is used as a vessel to get the plot moving; his references and reassurances (in one memorable exchange and moment of doubt, the elder statesman’s and cool Hal, sucking on a cigarette, assures Brian that having worked with Phil Spector and a legendary rooster of other talent, the young pup is on another level entirely of genius) are used to settle a young Brian in the grip of mania. But wait until the final sequences, a redeemed Brian breaking from his stupor, soundtracked by the stunning, and reflective diaphanous ‘Til I Die’ Surf’s Up – a song that took Brian a year to complete, and was to no one’s surprise by now, originally dismissed before being embraced by Mike Love. With the emphasis on these characters, most of the extended cast are reduced to walk-on parts and though some background is referred to, Van Dyke Parks and many others aren’t introduced at all, merely swanning about – apart from a meeting in the swimming pool – at various dinners and pool parties. Even his poor siblings Dennis and Carl are more or less demoted to the odd clueless look whilst Al Jardine doesn’t even get a line: Dennis himself succumbed to his own torments, which left him adrift of his family and band mates; his spiral into drink and drugs ended tragically when he drowned just weeks after his 39th birthday in 1983. It is the mixed portrayal of his cousin Mike Love that is emphasised, not really a hero or villain, but malcontent and totally unhip individual uneasy at the changing face of a turned-on L.A. in the grip of LSD. I feel a little sorry for Mike, played I might add brilliantly by an unrecognisable Jake Abel, who would eventually have to lead the group and take up the mantle; always that little bit older, not so fortunate in the hair department (his fetish for hats arguably covering up his early balding), and ever the professional he found it hard to fit in. 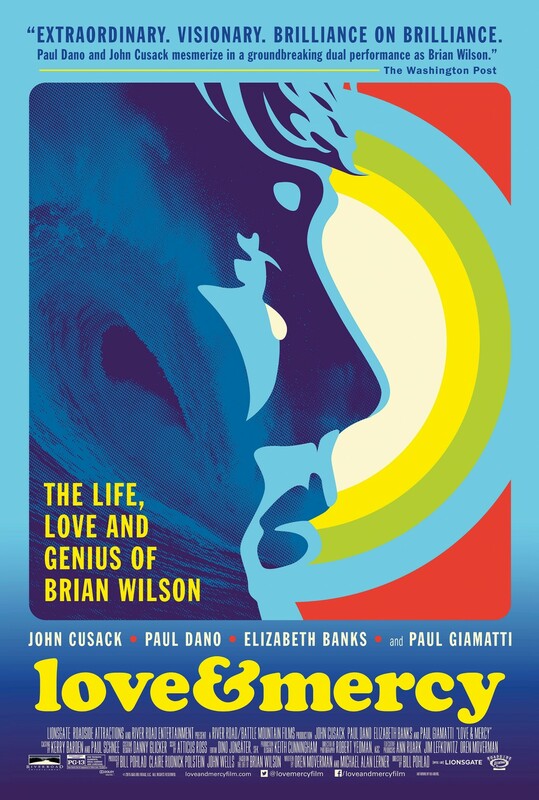 Love & Mercy moves full circle, Melinda coaxing the responsive artist and adult from his child like shell, and finishes with Brian’s – and I was lucky enough to attend one of his comeback shows with the Wondermints – return to the stage in the noughties, performing the titular song. Those stumbling blocks and manias that prevent not just geniuses, from making their ideas concrete, still persist. But at least Brian finally received the correct diagnosis of manic depression with auditory hallucinations that can be successfully treated: Landy’s schizophrenia diagnosis and treatment did more harm than good, arguably worse than the cocktail of illicit drugs that Brian was popping so freely before the quack came on the scene. The best hope is that this movie encourages discussion; that we can talk candidly and address the controlling mechanisms that condemn many people to a life spent dealing in isolation with their mental health. For the record, our personal favourite Beach Boy albums. The Beach Boys: Made In California.